Every February 14th the thoughts of couples turn to the centuries old custom of sending a valentine to the one they love. The legend of St. Valentine, a priest in Rome, dates back to the 4th century. Valentine was imprisoned for performing clandestine weddings for Roman soldiers who were forbidden to marry because the emperor thought single men made better soldiers. While in prison, Valentine befriended his jailer, who had a blind daughter, Julia. Valentine is reported to have performed a miracle and healed Julia. Her forty-four member household was later baptized and became Christians. In order to remind the soldiers, and other persecuted Christians of God’s love, Valentine made small parchment hearts for them to carry, the possible origin of the custom of giving heart-shaped cards on Valentine’s Day. The night before Valentine was scheduled to be executed; he wrote a farewell letter to Julia, signing it “From Your Valentine”, perhaps associating this saint forever with love. 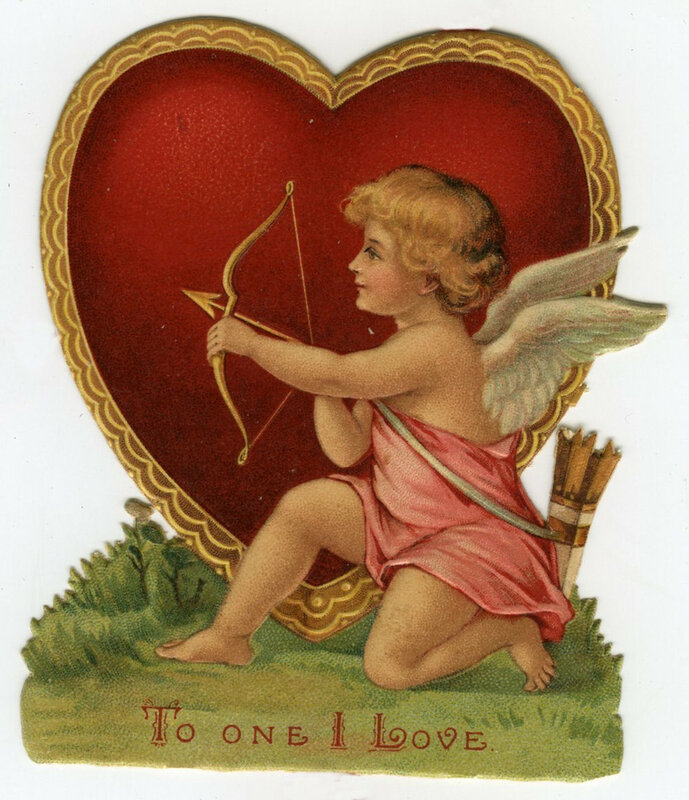 The first commercial valentines appeared around 1800 in England, and were not very ornate. A half-century later, they were transformed into works of art with the use of satin, ribbons and lace. Included were delicate verses along with pictures of turtledoves, bows and arrows, cupids and bleeding hearts. During the Gay Nineties, valentine cards took on a more garish look, being festooned with spun glass, mother-of-pearl, imitation jewels and silk fringes. A Mount Holyoke college student, Miss Esther Howland, created the first truly American valentines. Until that time most cards were imported from England. Around 1830 she used imported lace and fine papers to create her cards, eventually employing several assistants. Her entrepreneurship brought in a hundred thousand dollars annually—over 1.5 million in today’s dollars! Elderene (Halvensleben) Hasz taught at Hay Creek School from 1952-55. She recalled the Valentine's Day celebrations in a rural school. "We would take a big box and decorate it with white paper and lots of Valentines. It had a slot in the top and everyone would put his or her Valentines in the box. On Valentine's Day it would be opened and they'd be passed out. I think back then, everybody gave a Valentine just to their favorite friends, possibly because people didn't have a lot of money. But everybody would get a Valentine, no one was left out." The choosing of a mate has been a popular theme for romance novels, movies and television programs. Sauk County too has had its share of star-crossed lovers throughout its history. She was an “old maid”, and as the story begins, we learn that she was not blessed with abundant beauty, and was therefore overlooked by the eligible gentlemen of the day. So she decided to resort to a devious strategy in hopes of snagging a suitable beau. He was at a loss and couldn’t decide what to do. “He was too much of a gentleman to order her out and did not want to take her with him. There seemed to be no help for the latter course, and he was obliged to submit.” It was not a happy evening for him, and to add insult to injury, he did not dance a single dance with her. Inadequate postnatal care frequently resulted in the death of pioneer mothers shortly after childbirth, and that is apparently what happened to one family living on the prairie near Reedsburg around 1848. Marriages were oftentimes a matter of convenience in those days, and one unfortunate settler had recently lost his wife in childbirth. He stopped at each neighboring house with the question, “Is there any wimming here as wants to git married?” The response from within was not always comforting, for in one or two places he was answered by the sudden appearance of a broomstick. Soon he had exhausted all the homesteads on the prairie and headed for Reedsburg. There, someone remembered the old maid and suggested he seek her out. As the narrator of our story continues, “He did not have to journey further. A match was immediately made, the marriage taking place scarcely a week later. To paraphrase an old saying, “Beauty is in the heart of the beholder.